Hi All! I have some very exciting news--I have relocated to Switzerland! More on this later!! For now, I had an exciting opportunity to announce this using an email marketing platform provider called, "Campaign Monitor," that allows you to send emails to your subscribers. If you are on my subscriber list, you would have received this announcement over the weekend. If not, please sign up now by clicking this link. Campaign Monitor is this awesome, easy-to-use platform to send emails to your subscriber list or customer base that can feature an important announcement, distribute a newsletter, send deals or offers on products you sell, obtain feedback, announce events, or confirm an action taken on your website like a hotel booking. It's really cool! It has beautiful templates that you can work with so that even those who are not that tech savvy (like myself!) 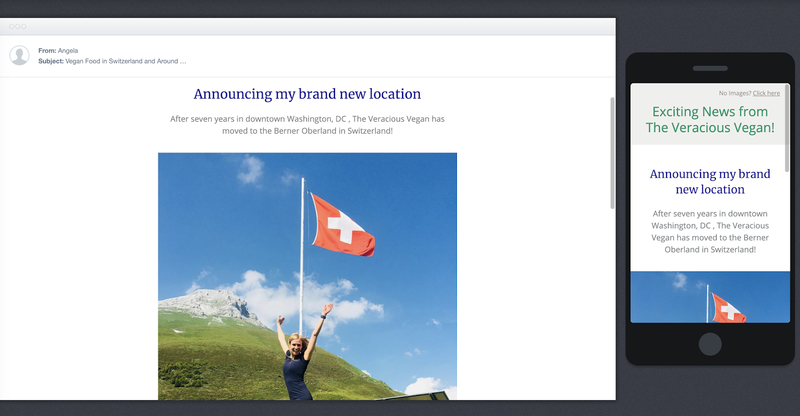 can create gorgeous, eye-catching emails in very little time. First, I answered some questions about my business. I indicated that my contacts were stored in a csv file that I was able to pull from Feedburner and I indicated that I was the only person using this account. Done. Then, you have the option to watch a five-minute video on how to get started, which I did. I thought it went a bit too fast as I wasn't able to catch everything, but it was a nice quick overview to show me that this process would not be too difficult. Then, you must choose your plan. 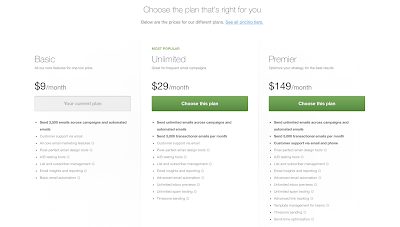 For just $9 per month, you can send 2,500 emails across campaigns, receive customer support via email, access all core email marketing features, and have access to the insights analytics suite. That sounded sufficient to me! 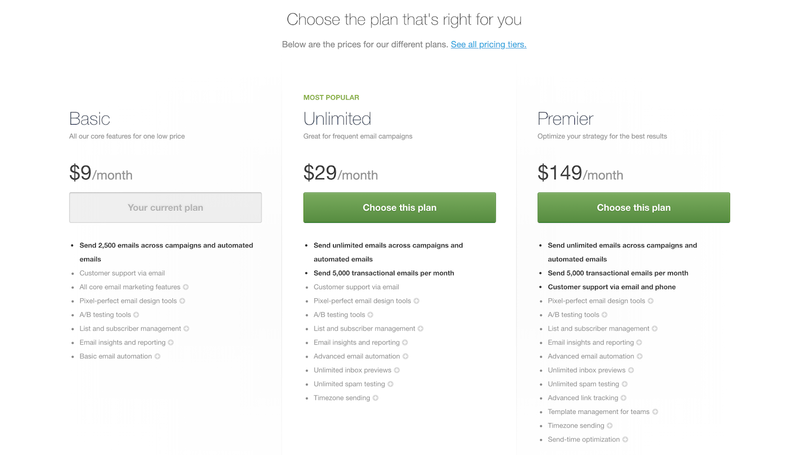 There are other options for $29 and $149 per month that offered features I truly didn't need. Once I signed up and paid the $9 fee, I was able to sign up for a 30-minute webinar that is offered once a week. That sounded great, but the next webinar was scheduled in five days and I was anxious to get this email out, so I skipped signing up for that. To begin, you choose who you would like the email to come from, i.e., which email address, what the subject line will be, and whether you'd like the subject line to include your subscribers' first names. Next, you choose a starting point by choosing a design. I chose an Announcements design and was shown many cool templates. Once I double clicked the template, I was able to start customizing it. I was amazed at how easy it was. 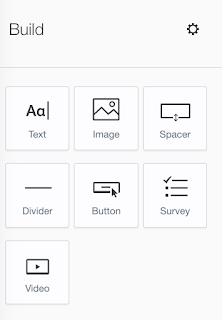 You can keep all the predefined fields in the design if you like or you can swap them out for other types of content. For example, you can keep a text box as text or change it to a picture. You have a bunch of options on the left-hand side that allow you to customize as you wish. I used mostly text and picture buttons. I had to play around with the text options to get the look I wanted. 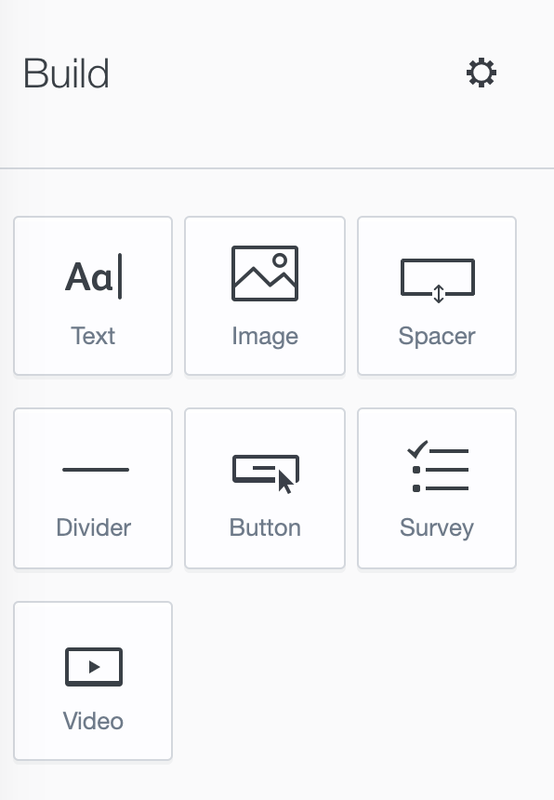 There are lots of options for fonts and colors. For the pictures, you could resize them within a limited range. I was surprised that you could crop images, but not rotate them as one of my images was accidentally taken upside down and I couldn't use it because I could not flip it right-side up. I had a little trouble sizing two pictures at the bottom of the announcement as they were set up to be next to each other in one row, but they were different sized pictures, so when I made one the same size as the other, there was a lot of white space remaining in the picture box surrounding the picture itself. I figured out how to change the background of this white space to gray and then it looked a lot better. 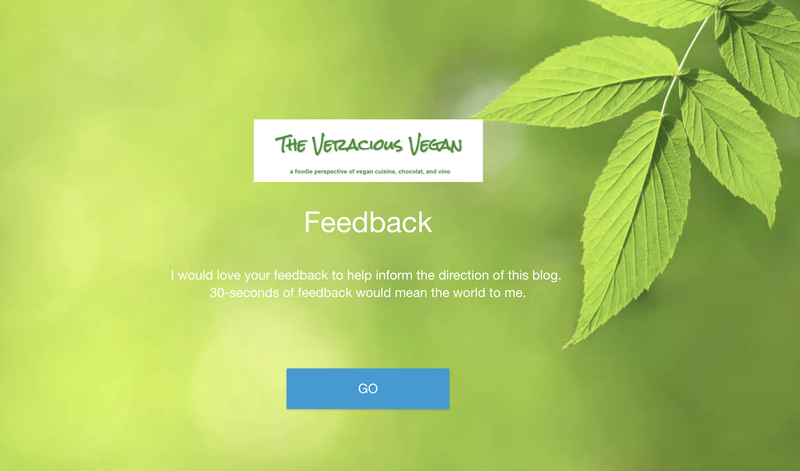 I also thought this would be a great way to collect feedback from my subscribers on what they like about my blog and any suggestions for improvement, so I inserted a feedback survey. Campaign Monitor partners with getfeedback to allow you to create a simple survey for free. For more robust options, you must pay. So, I created a four-question survey as well and linked to it in my email. 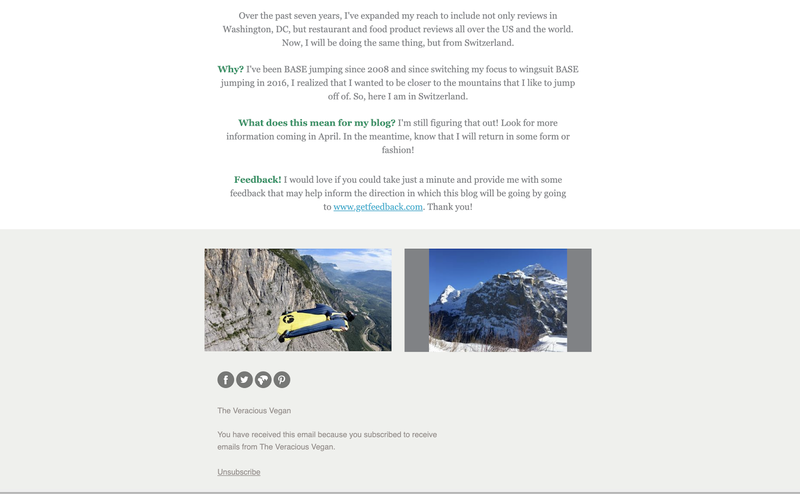 In the end, after fully designing a simple email announcement, the only thing I couldn't figure out how to do was change the color of the top header and bottom footer, which I wanted to do. Oh, well. The header serves as the place you can put your logo. 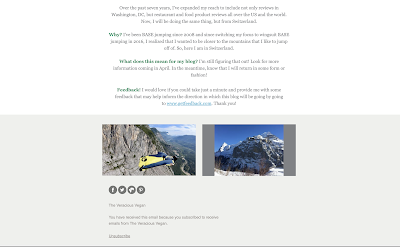 The footer allows you to link to all your social media accounts using the nice little logos--looks very professional. I loved this feature. Once completed, you can preview your campaign to see how it will look via email and mobile. This is another great feature. Even after previewing it, I sent myself a test email and then I saw what really needed to be changed. Once I was sure I was ready, I went to the Define Recipients screen. I uploaded my csv file with no issues. Then, I got to choose to send the campaign now or schedule it to be sent in the future. I just went ahead and sent it Now! The next day, I checked my Insights on Campaign Monitor. This is great information. It showed that 26.5% opened the email, 3.23% clicked the links and 10% bounced. The information is displayed in a really easy to understand format. I also check my gofeedback page, but no one had completed the survey yet. I completed it myself, then reviewed the results and it looked like an easy-to-understand format. Very basic for the free version. In the end, I'm really excited about Campaign Monitor and may continue to use it going forward. I think it's a great platform, is easy to use and user-friendly, and offers great insights to understand the effectiveness of your campaigns. To learn more, click here. Full Disclosure: Although I was compensated to review Campaign Monitor, that in no way influenced my veracious opinion. 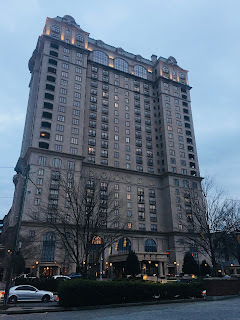 I recently had the pleasure of staying at the St. Regis in Atlanta, a 5-star hotel. I'll start by saying that this hotel is amazing. It is definitely one of the nicest places I have ever stayed and the service was beyond belief. 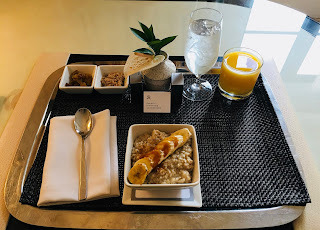 I was there for an event that my company was putting on so all of my food experience was from in-room dining and special catering by the hotel. On my first morning there, I ordered the McCann's Irish Oatmeal. These steel cut oats were topped with banana brulee and served with raisins and brown sugar. I paired this with a freshly squeezed orange juice. 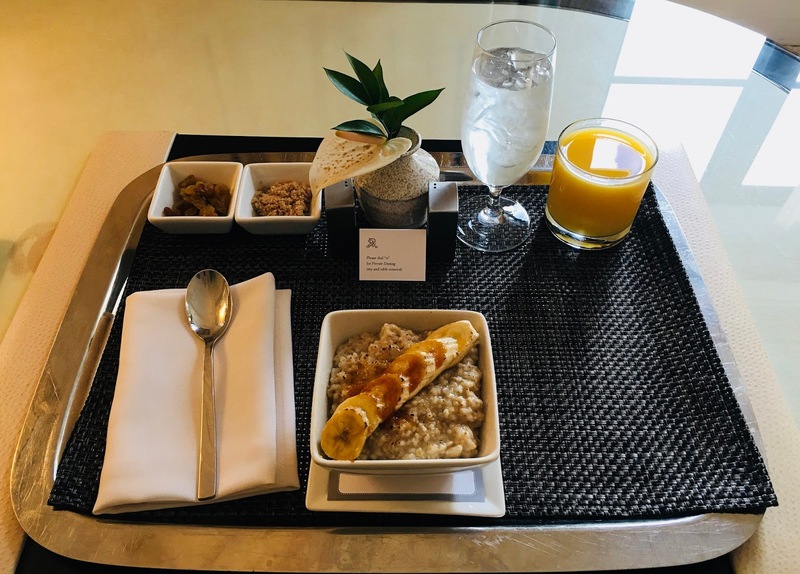 For $33, it was the most expensive oatmeal and orange juice of my life, but also the best. 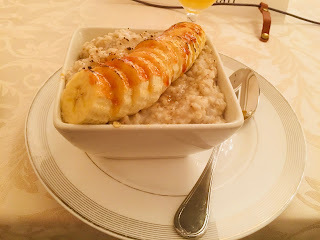 It was like they torched the bananas with that sweet topping and there were oh so good. 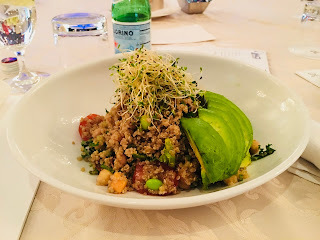 For my lunches there, the good new is they had a vegan meal on the menu. The bad news is that there was just one vegan meal and little did I know, they planned to serve me the same meal every day for four days. 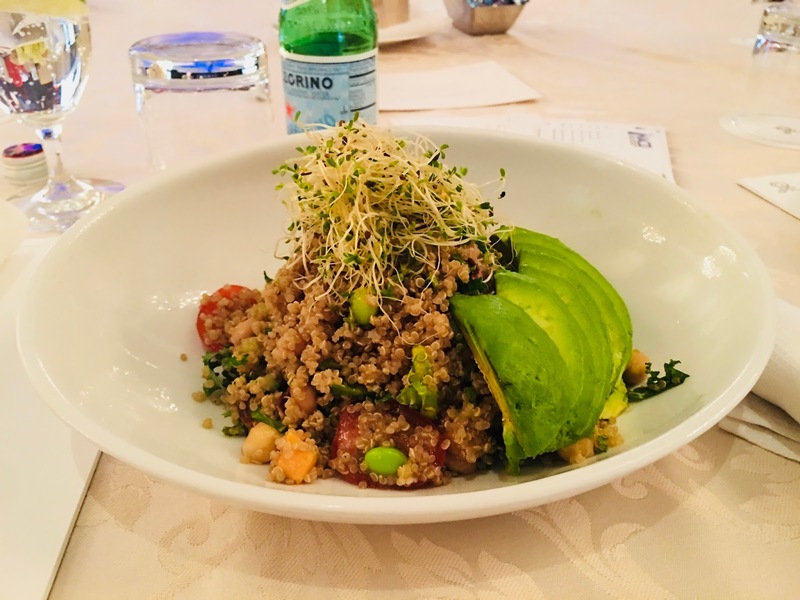 On day one, I thought the Quinoa and Kale Power Bowl was great--chickpeas, black eyed peas, cherry tomatoes, cucumber, edamame, sweet potato, and miso vinaigrette with alfalfa sprouts and avocado. It's so much goodness in one bowl. But, by day four, I had to walk across the street to Whole Foods to get something different. One morning, they served me potatoes sauteed with greens and mushrooms and it was fantastic! Bowls of fresh fruit were served as my dessert. 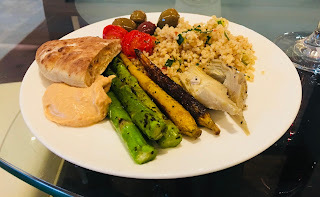 And at our reception, there were lots of vegan options including hummus, olives, grilled asparagus and carrots, tabbouleh, and artichoke hearts. My good friend in Atlanta has been raving about this diner that is open 24 hours and is vegan friendly for a long time. Since I had a whole week in Atlanta, I finally got to check out the R. Thomas Deluxe Grill! Now this place is a funky place. 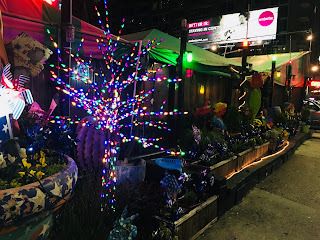 It was quite dark on this weekday night, but what I could see was eclecticism! Holiday lights, pinwheels, plastic flamingos, and plants all graced the outside of this restaurant. On the way in there were caged birds like Toucans that were apparently all rescued birds. They were sleeping so we didn't mess with them, but I was curious as to the story behind the birds as an animal activist myself. 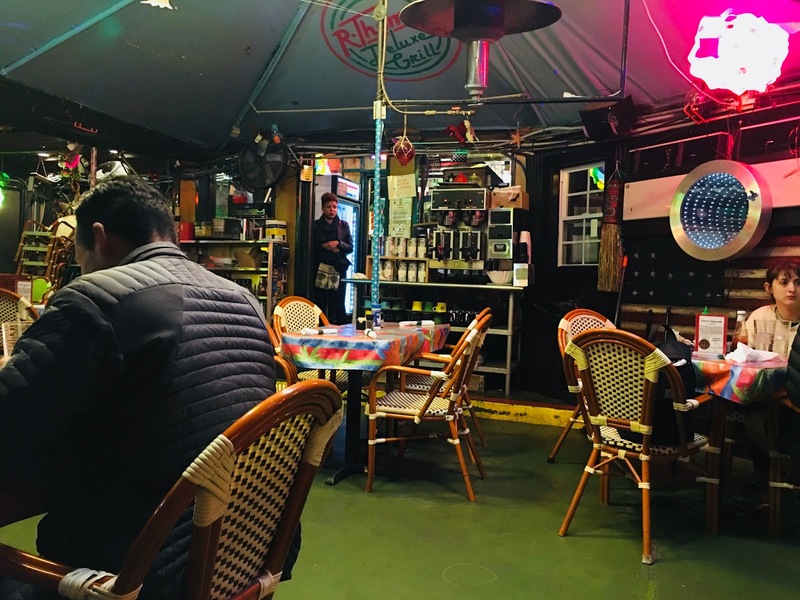 Inside, the funkiness continued with brightly colored tablecloths and a green floor within the tent that shielded us from the outside. 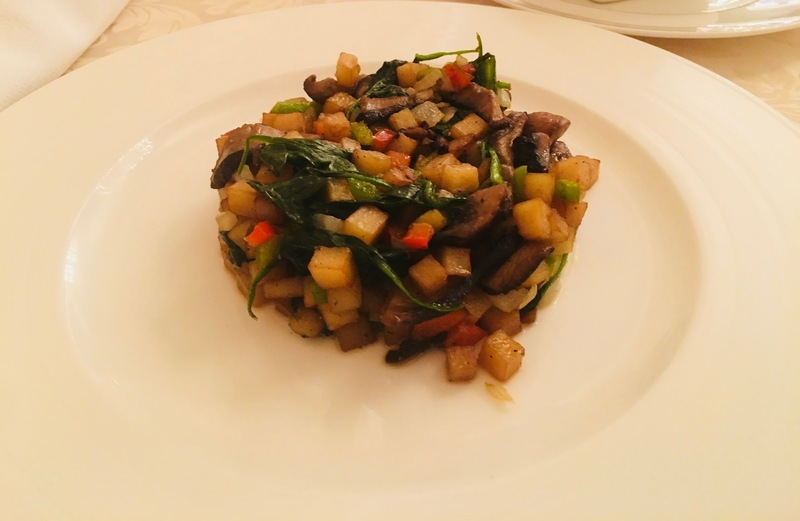 The menu was extensive and hard to navigate as nothing was labeled vegan. As soon as I asked though, the server said that many things are vegan and began to list them as he was apologizing for a menu that he said hadn't been updated in decades. Wow! 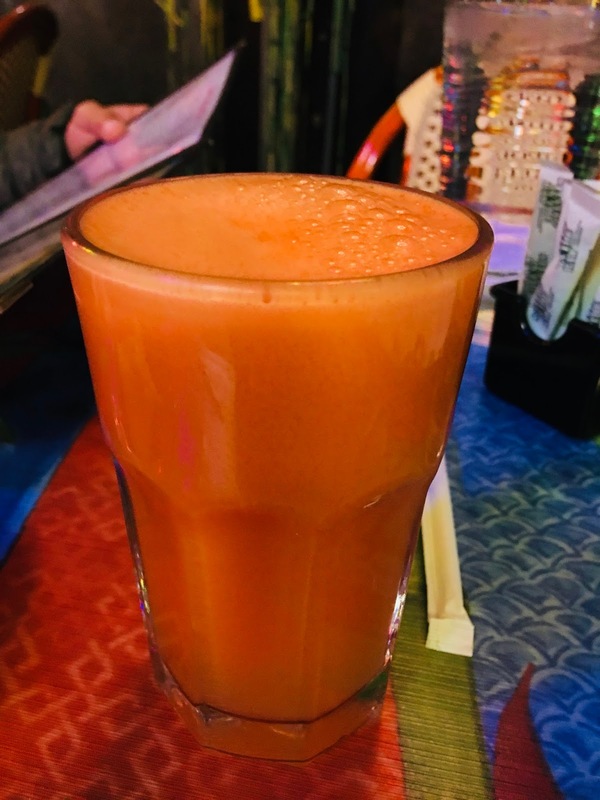 I started with a fresh juice, the Champ, made with organic carrot, apple, and ginger. Yummy. 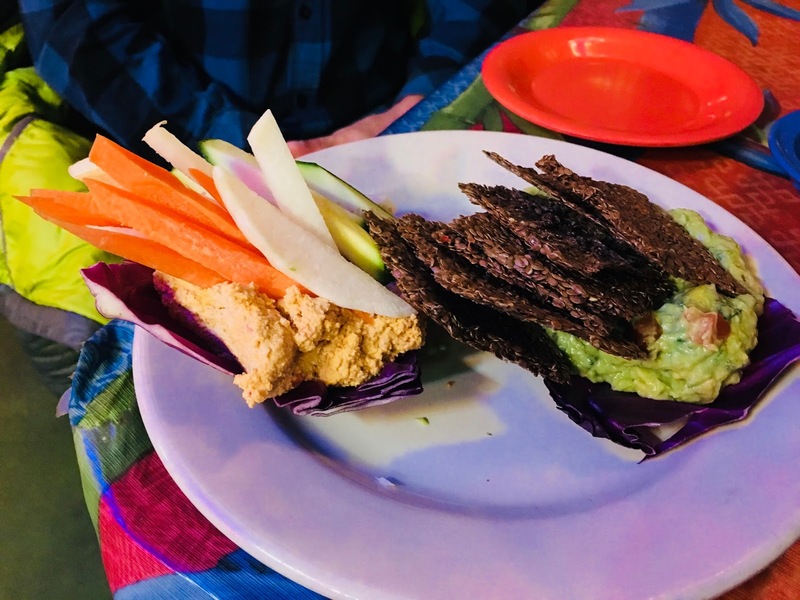 For our started, we chose the Raw Walnut Sunflower Pate and Raw Guacamole. Our server said the cashew cheese was better than the sunflower pate so we subbed that out. It showed up with Flackers flax chips and carrots and other veggies. Both spreads were fantastic. We were very pleased. I asked what the server recommended as a vegan entree and he said The Southern Vegetarian was vegan, so I went with that. 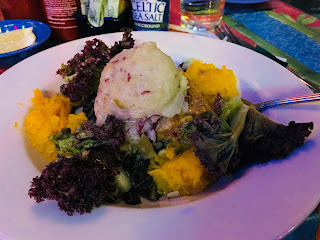 This hearty meal had layers of millet corn casserole, collard greens, smashed potatoes, and shiitake mushroom gravy surrounded by butternut squash and a salad with chili flax dressing. 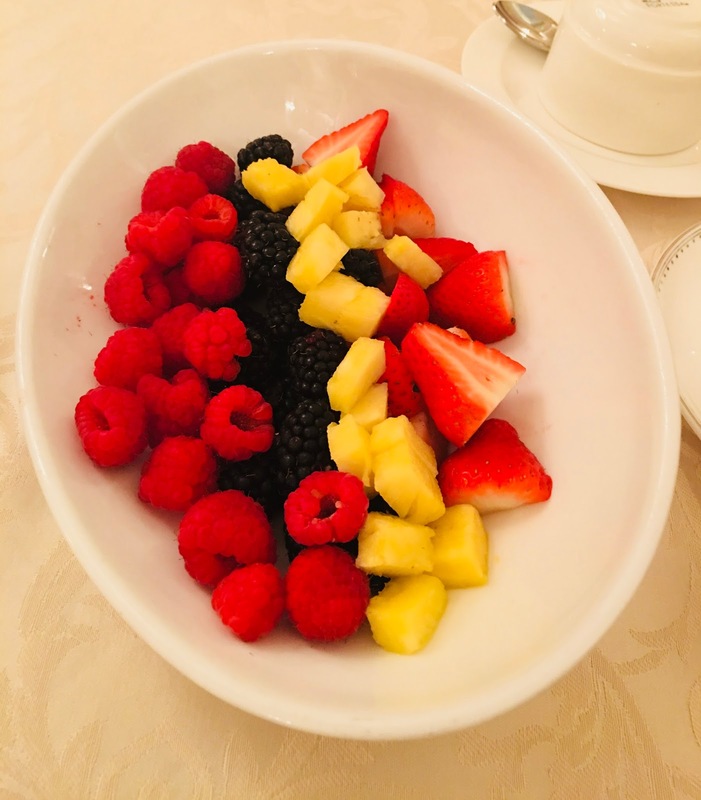 It was simple and delicious. 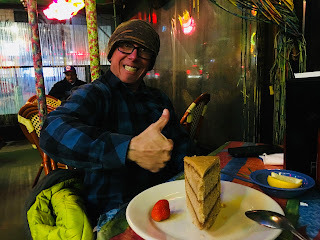 For dessert, we got a massive slice of caramel cake. The cake tasted like it had been frozen and was a bit too cold, hard, and perhaps stale. It had good flavor, but wasn't as fresh as it could have been. Prices here were pretty reasonable at $15 for the entree and $10 for the raw appetizer. The service was great, the decor and environment fun, and the food was good. I give this old school 24/7 diner two thumbs up! Interestingly enough, when I asked the locals where I could go for good vegan food, they all said that True Food Kitchen was great. 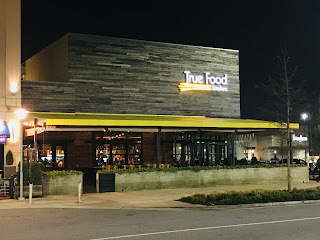 True Food is a chain that also exists in Maryland, which is somewhat close to where I live, so I wasn't sure if I wanted to waste one of my dinners on a restaurant that is close to me. But, seeing that I hardly ever go to Maryland and this seemed like the restaurant of choice, why not?! 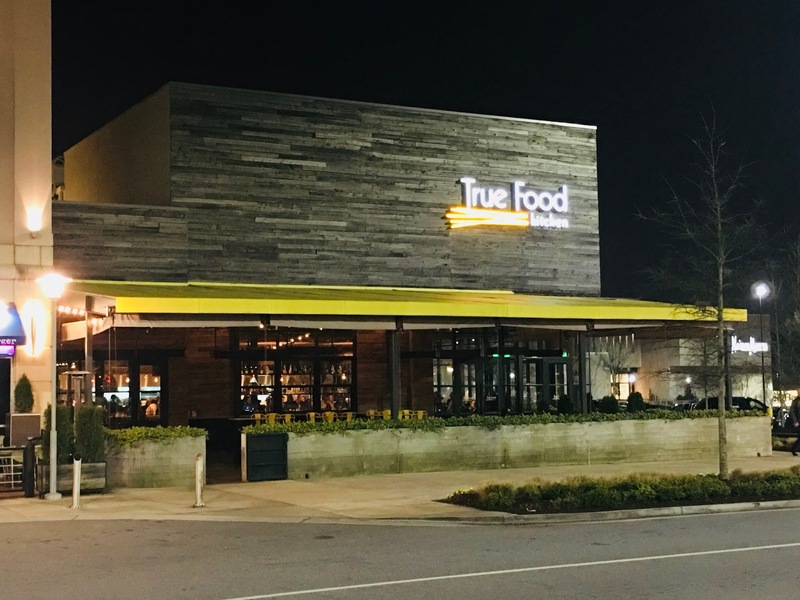 True Food is located in Lenox Square in Buckhead, which is a very fancy mall. Amidst the Lamborghinis and Porsches, I was finally able to find a parking spot after circling for 15 minutes. How all the parking spots were taken on a Tuesday night, I will never understand, but there is also the option for valet parking. Inside True Food, it was just as busy! 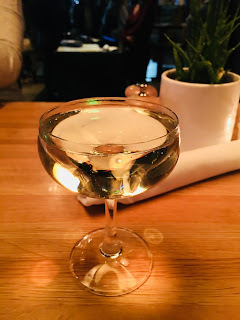 My friend was meeting me in 20 minutes or so, so I added my name to the list and took a seat at the communal high top tables, sipped a Prosecco, and waited. I was seated with other lone tourists who struck up a conversation that kept me interested until my friend arrived. The decor was inviting with its bright green booths and large lighting fixtures. Wine bottles lined the walls and the open kitchen was interesting to watch as well. When my friend arrived, our table was ready. What I love about the menu is that there are tons of vegan options and they are labeled as such. For appetizers, I could choose from Shiitake Lettuce Cups, Kale Guacamole, Charred Cauliflower, and Winter Squash Toast. The Charred Cauliflower appeared to be the crowd favorite, so we went with that and I'm so glad we did! 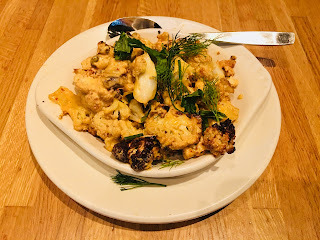 The cauliflower was covered in harissa tahini and mixed with fresh dill and mint along with pistachios and medjool dates. It was fantastic! For my entree, there was so much to choose from including vegan pizza. 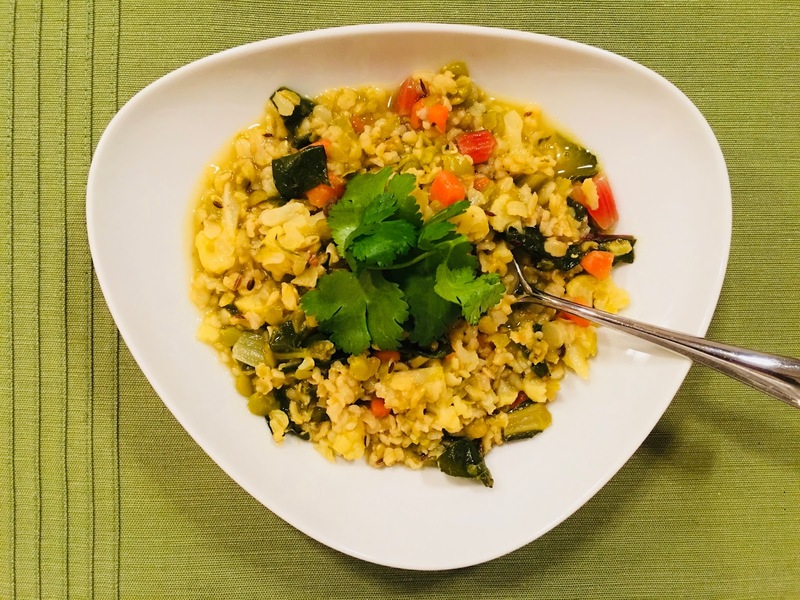 I ultimately went with the Ancient Grains Bowl. 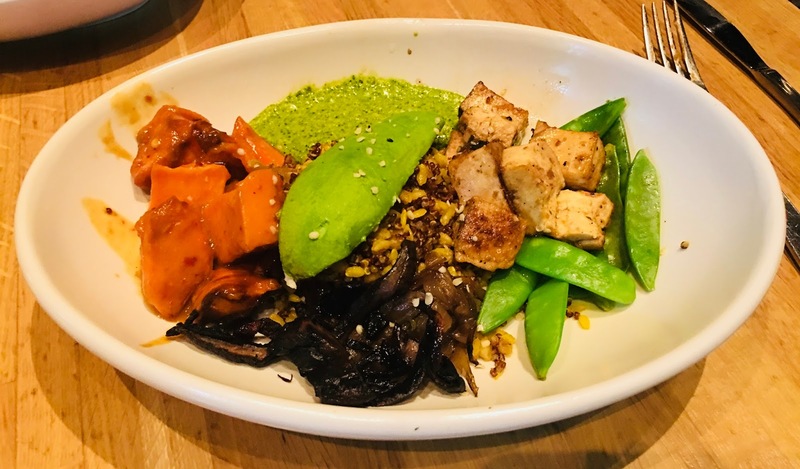 Miso glazed sweet potatoes, charred onions, snow peas, grilled portobello, and tofu were topped with turmeric, avocado, and hemp seeds. There was also pesto in my bowl, which wasn't on the menu and seemed like an odd pairing. 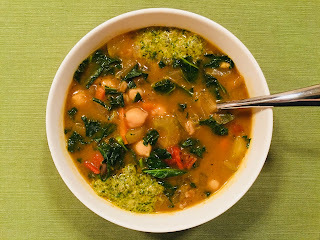 Other than the pesto, I thought it was great! 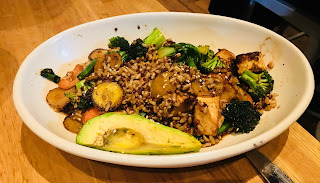 My friend ordered the Teriyaki Quinoa bowl with broccoli, carrots, bok choy, mushrooms, brown rice, avocado, and sesame seeds. It had a great charred flavor to it and was very tasty. 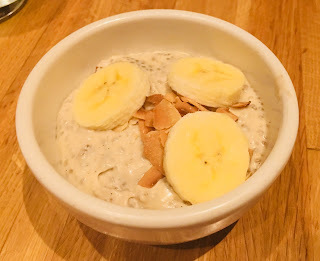 For dessert, we ordered the chia seed pudding with bananas and coconut chips. Again, another delicious dish. The bowls were $17 and the appetizer was $9 so a bit on the pricey side, but it was all so worth it. The service was pretty good. The only bad experience we had was that we were both brought the wrong dishes initially and my friend's had fish sauce in it, which neither of us realized until it was too late. Both our meals were replaced, but that wasn't cool. Besides that though, the food was really exceptional. I'd eat here again in a heartbeat and may even check out the one in Maryland too! 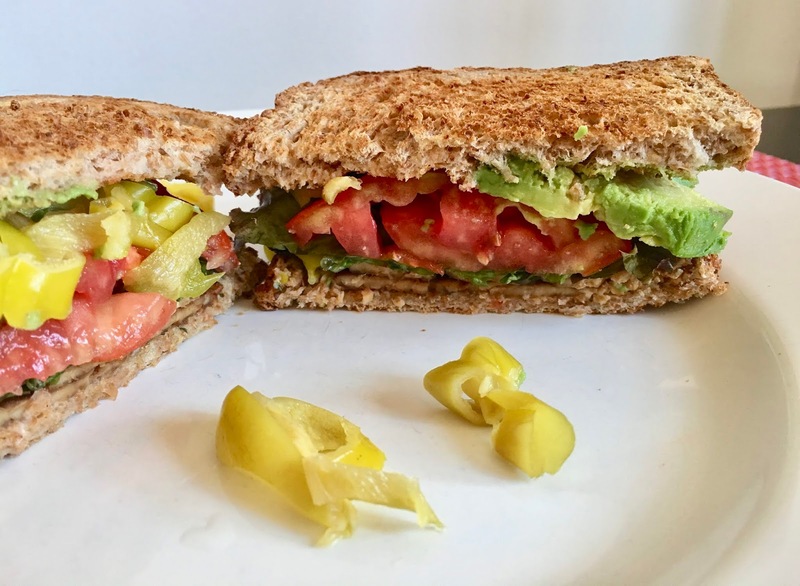 Whole Foods created a sandwich that became a viral sensation -- the Tempeh Bacon, Tomato, Lettuce, and Avocado or TTLA, which is, of course, a spin on the BLT--bacon, lettuce and tomato. 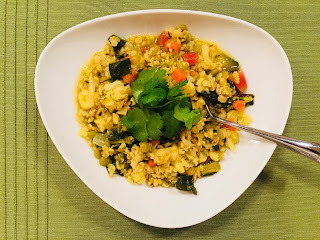 Lightlife makes the best tempeh bacon I've ever had. It is smoky, salty, and delicious. I may have just eaten out of the package at one time. Lightlife recently contacted me and asked if I would make my own version. I'd be happy to! 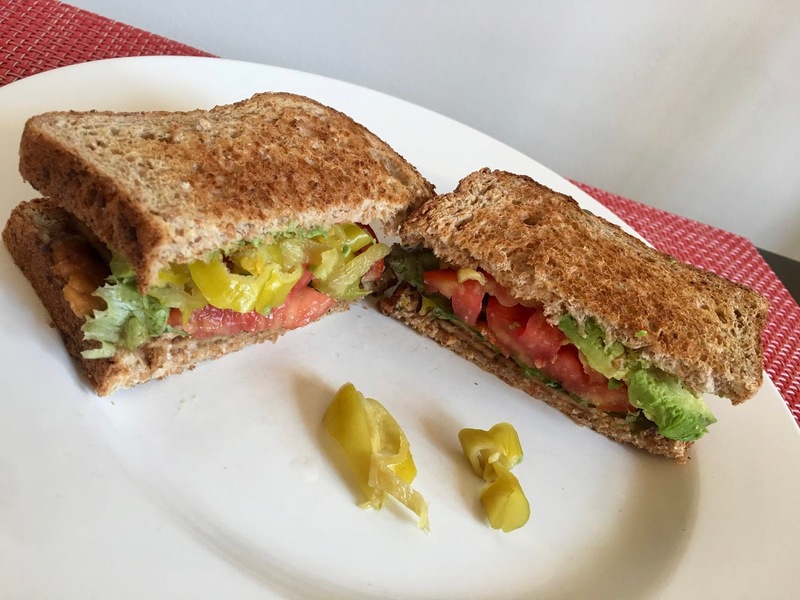 This sandwich is one of my go-to's, so how can I spin this to make it different? I started with the bread. Instead of using ciabatta, I went with a hearty sandwich bread from Alvarado Street Bakery--the sprouted whole wheat. I toasted it lightly, then added some Organic Vegenaise to one side, fried the tempeh bacon or "Fakin' Bacon" as they call it, and layered it on the bread, then topped it with lettuce, heirloom tomatoes, and avocado. Lastly, to give it a kick, I put Jeff's Naturals sliced golden Greek Peperoncini on top. It was exploding with flavor! All of these ingredients really make for an irresistible sandwich that you don't even want to put down. I gobbled it up in just a few minutes and wanted more. Seriously, you have to try this. Lightlife has won the fakin' bacon contest for sure with a delicious product seasoned just right. 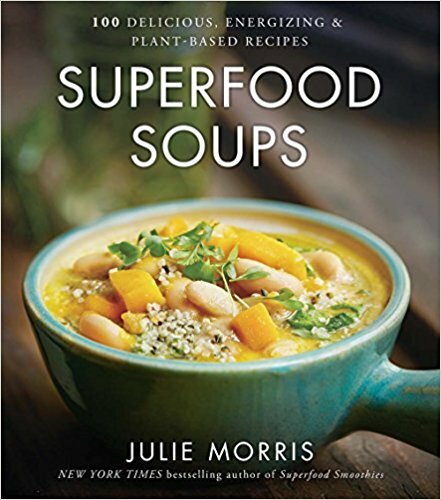 Full Disclosure: Although the ingredients were provided to me at no cost to review, that in no way influenced my veracious opinion. 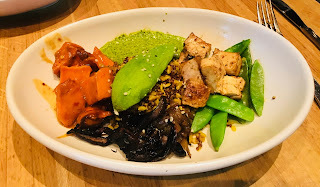 In search of a vegan restaurant in Atlanta that I'd never been before, I came across Green Sprout. 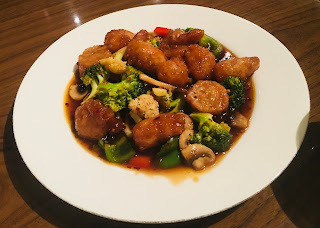 This vegan Chinese restaurant has been in business in Atlanta since 2003 and was one of the only veg restaurants open on a Monday, so I headed over. On this early Monday evening, there was no one in the dining room. I took a seat at a booth and perused the menu. The decor was typical for a Chinese restaurant--simple with shiny tables and chairs. 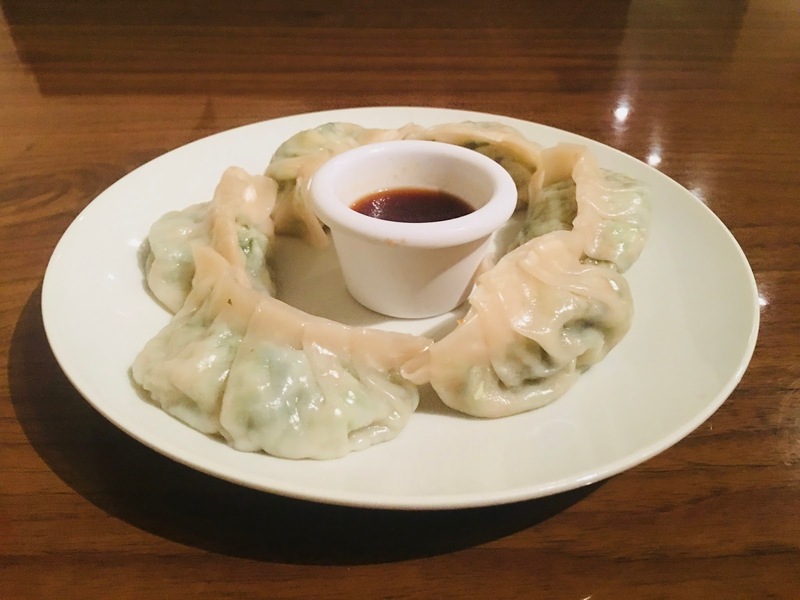 I started with steamed dumplings filled with bok choy, carrot, and soy protein. They were okay, but the sauce was nothing special and, therefore, the appetizer wasn't anything special. For my entree, I went with one of their most popular entrees--the Empire Soy "Chicken." Crispy soy "chicken," broccoli, cauliflower, bell pepper, and mushrooms were cooked in a ginger brown sauce and served with brown rice. I asked for spicy, but it wasn't spicy at all. It was pretty plain in general. The entree was $15, which, for what it was, seemed a bit pricey. The service was fine--as I was the only patron, they were attentive to my needs. But, all in all, I left underwhelmed. As the whole menu is vegan, perhaps there are other items that are tastier than what I ordered.